We're sure that you are well aware of the frequently used phrase: there's an elephant in the room. In fact, maybe this is an idiom you say often, especially if you happen to find yourself in lots of awkward social situations. Anytime during these clumsy interactions, have you ever wished that there was an actual elephant in the room? Ya know, just to lighten the mood and hopefully make some of the more nervous folks feel at ease; maybe crack a smile or chuckle? If so, we have exactly what you've been searching for! Just outfit your infant in this cozy and cuddly elephant costume then take the little guy with you wherever you go. The next time you land yourself in an awkward position just point at the tiny elephant in your arms, grin slightly, and say, heh, I guess there must be an elephant in the room! Everyone will get a kick out of it and all the uncomfortable tension will disappear completely. All eyes will be on your adorable little pachyderm! 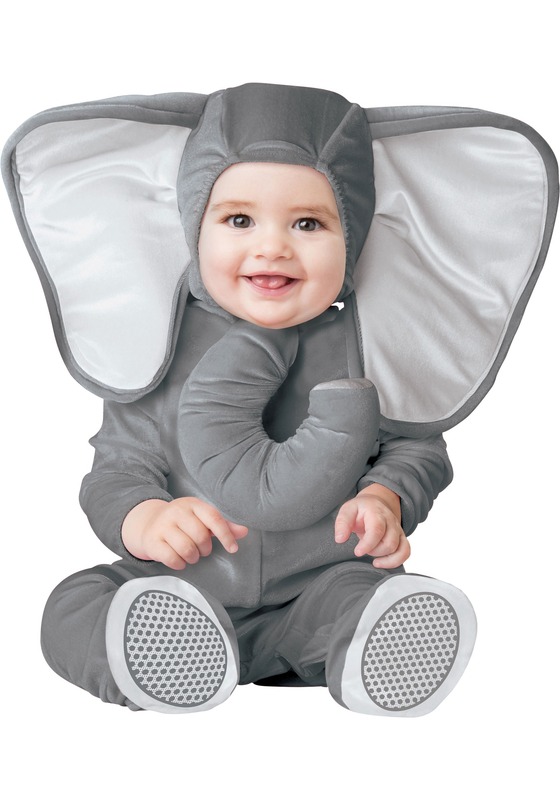 This elephant costume for infants will surely make this feasible situation a reality. The soft gray onesie has snaps for easy diaper changes while the character hood fastens under the chin and has large ears and a trunk. Both pieces of the apparel are soft, comfortable, and convenient for both parents and babies. You'll love being known as the mom or dad who is always responsible for making sure that there's a little elephant in the room!